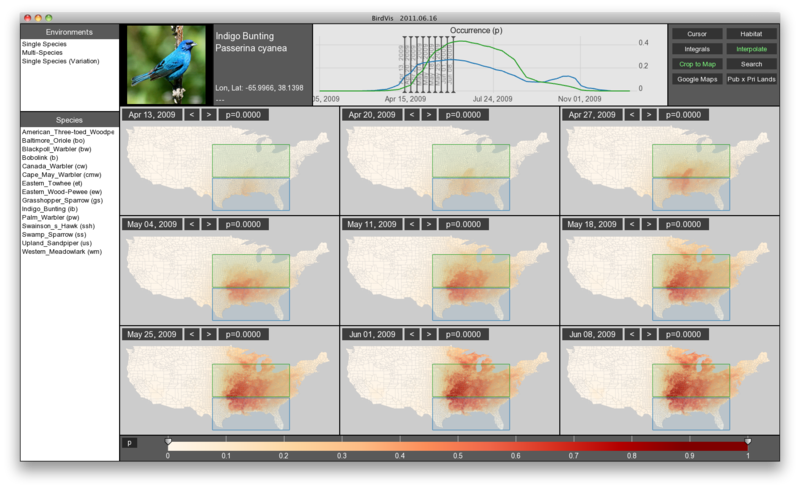 Screenshot of BirdVis showing the 2009 spring migration of Indigo Bunting. Birds are unrivaled windows into biotic processes at all levels and are proven indicators of ecological well-being. Understanding the determinants of species distributions and its dynamics is an important aspect of ecology and is critical for conservation and management. Through crowdsourcing, since 2002, the eBird project has been collecting bird observation records. These observations, together with local-scale environmental covariates such as climate, habitat, and vegetation phenology have been a valuable resource for a global community of educators, land managers, ornithologists, and conservation biologists. By associating environmental inputs with observed patterns of bird occurrence, predictive models have been developed that provide a statistical framework to harness available data for predicting species' distributions and making inferences about species-habitat associations. Understanding these models, however, is challenging because they require scientists to quantify and compare multi-scale spatio-temporal patterns. To do so, a large series of coordinated or sequential plots must be generated, individually programmed, and manually composed for analysis. This hampers the exploration and is a barrier to making the cross-species comparisons that are essential for coordinating conservation and extracting important ecological information. BirdVis is an interactive visualization system that supports the analysis of spatio-temporal bird distribution models. BirdVis leverages visualization techniques and uses them in a novel way to better assist users in the exploration of interdependencies among model parameters. Furthermore, the system allows for comparative visualization through coordinated views, providing an intuitive interface to identify relevant correlations and patterns. The BirdVis source code is available at GitHub. We have prepared a short tutorial to help users get started in using the system. BirdVis uses other freely-avaiable software: dependencies. The bird pictures displayed in BirdVis were provided by Bill Schmoker (http://schmoker.org). Thanks Mathias Schott (University of Utah) for sharing some of his rendering knowledge with us. Some Screenshots of BirdVis can be seen at screenshots. A video demonstrating BirdVis in action can be found at youtube. To appear in IEEE Transactions on Visualization and Computer Graphics, 10 pages. This work has been supported by the Leon Levy Foundation; the Wolf Creek Foundation; the National Science Foundation through DataONE (0830944), IIS-0905385, IIS-0844546, IIS-0746500, CNS-0751152; the Institute for Computational Sustainability (0832782), research grant (1017793); TeraGrid computing resources provided under grant numbers TG-DEB100009 and DEB110008.